Aviair, together with APT Kimberley Wilderness Adventures are excited to offer a once in a lifetime opportunity for you to experience an exclusive performance in the Bungle Bungle. 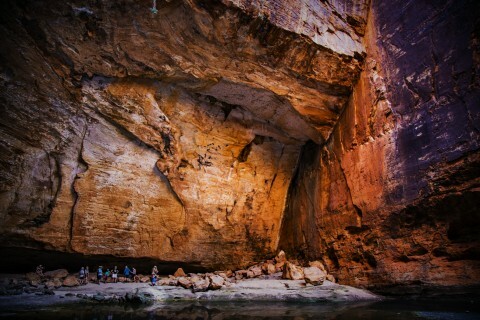 An ensemble of 5 principals from the Sydney Symphony Orchestra will perform live in Cathedral Gorge, a natural amphitheatre and the perfect stage for a breathtaking performance – both acoustically and visually. During the period from the 12-17 September inclusive, a daily performance will take place, with seating at Cathedral Gorge and drinks and canapés provided for our guests. The Diamond Class air tour is one hour each way and takes you on an unforgettable flight over the Bungle Bungle Range, Lake Argyle, the Argyle Diamond Mine and the Ord River Irrigation Area. The aircraft are all air-conditioned and high wing which offer comfort, safety and spectacular viewing opportunities. Your 2 package options are listed below. Includes Diamond Class return scenic flights, airport transfers, one day land touring to Piccaninny Creek and Cathedral Gorge, performance by Sydney Symphony Orchestra, overnight accommodation at Bungle Bungle Wilderness Lodge. Meals - Lunch and Dinner on Day 1 / Breakfast on Day 2 before departure. Includes return Diamond Class scenic flights, airport transfers, two days land touring including Piccaninny Creek, Cathedral Gorge and Echnida Chasm. Sunset drinks viewing the Bungle Bungle massif. Two nights accommodation at Bungle Bungle Wilderness Lodge. Meals – Lunch and Dinner on Day 1 / Breakfast Lunch & Dinner on Day 2 / Breakfast on Day 3 before departure. This is a unique, once in a lifetime opportunity that is definitely not one to be missed. Please contact the reservations team on (08) 9166 9300 to make a booking.